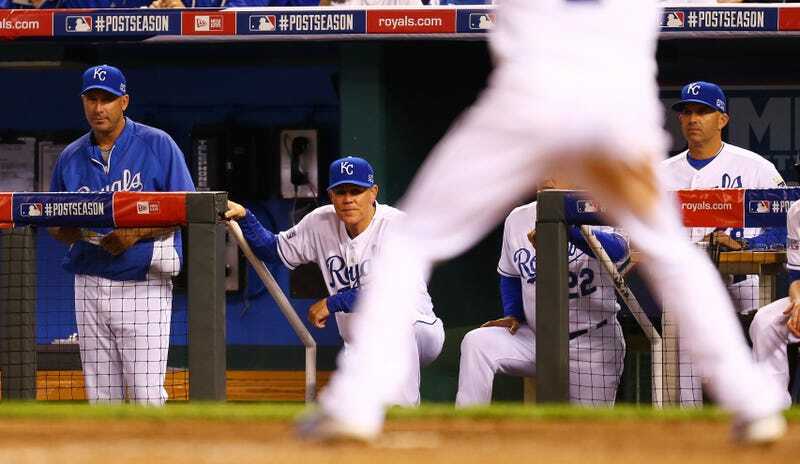 Ned Yost On His Bullpen Moves: "It Just Didn't Work Out"
Baseball games are at their most dramatic and chaotic when a team struggles to a win despite the best efforts of their manager. In recent years, Tony La Russa was a master of this; Ron Washington too. Usually, a fan base suffers in relative obscurity until it happens on a national stage. But if last night was the Royals' coming out party, America has now been officially Yosted. Ned Yost has a reputation for being set in his ways, and those ways aren't very good ones. But the endless bunting and constant base-stealing, despite going against the current wisdom regarding the value of at-bats, may simply work for this fleet-footed roster. ("That's what speed do" has been the motto around the clubhouse this year. Last night, seven different Royals stole a base.) If anything, Yost gets a pass for the small ball because it's a blast to watch. But it was Yost's bullpen usage that was so bad, so inexplicable, that it was the topic of conversation immediately following an all-time thriller, and remains so the morning after. We literally cannot talk about anything else but how strange it was to bring in 23-year-old starter Yordano Ventura on one day's rest. With James Shields up to 88 pitches and starting to run into trouble in the sixth inning, Yost had options. The Royals had one of the best, deepest bullpens in baseball this season, but Yost didn't want to go to regular setup guys Kelvin Herrera or Wade Davis because he's a creature of habit who likes to use them in the seventh and eighth, and not an out outside of those self-imposed boundaries. Yost said he considered bringing in lefties Brandon Finnegan or Danny Duffy to face the lefty Brandon Moss, but didn't because...who knows. Here's Yost's attempt at an explanation. "We had the decision there between Ventura, Finnegan and Duffy," Yost said . "All three young guys. Ventura came into a game earlier this year and actually won it for us by throwing an inning‑and‑two‑thirds of relief. He was lights‑out, and we got to that point where we just wanted to bring the gas. We wanted to bring the gas for the sixth, we wanted to bring the gas for the seventh with Hererra, Wade and Holly with a one‑run lead and it just didn't work out." "No," Yost said. "We didn't want to push Herrera two innings. As soon as Ventura got up, we had Herrera up warming up in case Ventura got two outs or started walking guys, we were going to by necessity bring him in. But we got to a 2‑1 count on Moss and he ended up hitting a three‑run homer right off the get‑go, so that kind of negated that. We ended up getting in some more trouble, brought Hererra in with one out and he ended up getting five. Kel's sixth inning wasn't real smooth. He was much better in the seventh, but just one of those things." So, to clear thing up, Yost wanted "the gas." But he didn't want to use Hererra for two innings, so he used him for one and two-thirds. It was "just one of those things." "That's the most incredible game I've ever been a part of," Yost said. Ned, look at Fangraphs' WPA chart. You see that big vertical slope halfway through? The one that should by all rights have sent the Royals home? That's you. You made this game more incredible than it had to be. That chart is a thing of beauty. Thanks, Ned, for an unforgettable game. You probably deserve to be fired, but we'd all be worse off if you were.